Add these lightweight neoprene dumbbells to your arsenal for resistance training, toning muscles. Adding difficulty to everyday tasks, and ultimately building a better you! Sold in sets of (1-4 LB) (5-7 LB) and (8-10 LB), pick and choose what weights work best for your routine and add heavier sets as you progress! - Neoprene coating helps prevent the dumbbells from slipping out of your hand while in-use and gives a comfortable texture. - Comes in pairs of 5 LB, 6 LB, AND 7 LB. Other sets available up to 10 LB. - Color coordinated with corresponding white lettering to denote poundage for easy identification, making grabbing dumbbells mid set a breeze! 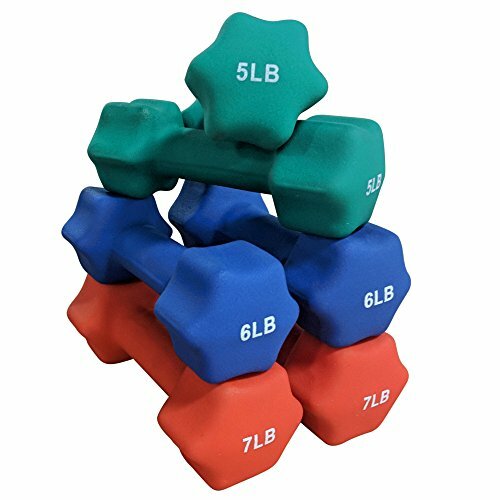 - Hexagonal shape prevents dumbbells from rolling all over the floor when set down between sets, also makes them stackable for easy storage! - 5 LB, 6 LB, and 7 LB. Neoprene coating helps prevent the dumbbells from slipping out of your hand while in-use and gives a comfortable texture. Comes in pairs of 5 LB, 6 LB, AND 7 LB. Other sets available up to 10 LB. Color coordinated with corresponding white lettering to denote poundage for easy identification, making grabbing dumbbells mid set a breeze! Hexagonal shape prevents dumbbells from rolling all over the floor when set down between sets, also makes them stackable for easy storage!